I am more than happy to help with any topic about small mammals not covered in the book. With regard to the skin and it’s stretching this is something that all mammals skins do, if you think about your own skin you can pinch the skin on your arm and it will spring back into place this is due to the fats and tissue under your skin that hold it in place. Indeed if you were fitting your own skin you would find the same loose skin problem, with a rigid polyurethane form (typically used for larger mammals) you would use a hide paste this works similar to the tissues under an animal’s skin, and helps you to taxi (move it around) the skin taking up the slack basically moving it around until it looks accurate and any wrinkles have been distributed evenly. With our bindup technique you need to work in a similar manner during the assembly process, I do not recommend a paste on beginner buindup small mammal. I did talk about taxiing the skin on the body page 126 along the back, and on page 128 talks about skin on legs, but will try and explain in greater detail. I do not believe in filling the skin out to its maximum extent, as with many animals this could be a huge distorted shape. See the Hornaman’s famous Walrus http://www.love-london-museums.com/horniman-museum.html compared to what they should look like http://en.wikipedia.org/wiki/File:Noaa-walrus22.jpg . In some cases when a skin has stretched dramatically a slight increase in body size might be necessary, but I would advise against that as standard practice. One thing that can happen is you didn’t take note of the amount of fat that might have been on the animal before you skinned it and made your manikin. As an example I can remember when I first started in taxidermy I was doing a leopard which had a huge big baggy belly I then made my manikin to fit the skinned carcass, obviously the skin did not fit, as nice fat belly was not incorporated into my manikin. This is where taking reference prior to skinning as well as after skinning can be useful. 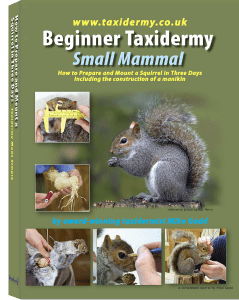 Your squirrel may have had a little extra fat but you would have still need to take the skin up as you work your way along the squirrel modelling as you go trying to even out any excess as you go, this should be all you need to do position the skin correctly. Just re read the sections on page 129 and 130 as these should also help.